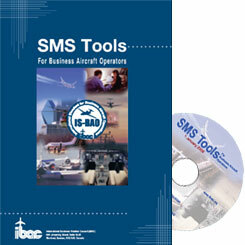 The SMS Toolkit was developed by a Working Group that had members from IBAC and a number of member association to assist non-commercial fixed and rotary wing aircraft operators, on-demand charter operators and other commercial operators to develop and implement safety management systems that meet the ICAO Standards and Recommended Practices (SARPs) and the regulatory requirements of major aviation regulatory authorities for such air operators. The Tool Kit is included with the purchase of the IS-BAO. It also can be purchased as a stand alone product. Current holders of an IS-BAO will receive the Tool Kit with their 2009 amendment.The Toolkit consists of a high quality 57 page hard copy SMS Tools booklet that provides a step by step process to develop and implement an SMS, plus a CD that contains an electronic copy of the booklet plus 18 tools and 6 reference documents in electronic format. There are also electronic links to numerous other related sources. The cost of the Tool Kit and associated material is $650 USD for association members and $1200 USD for non-members. Please contact an IBAC member association for the equivalent amount in local currency. To assist operators with their SMS development there are two SMS workshops associated with the Toolkit. The first is a two day workshop on the on the basics of safety management and safety management systems, and the second is a one day workshop on use of the SMS Toolkit. Contact an IBAC member association to learn about workshops close to you.